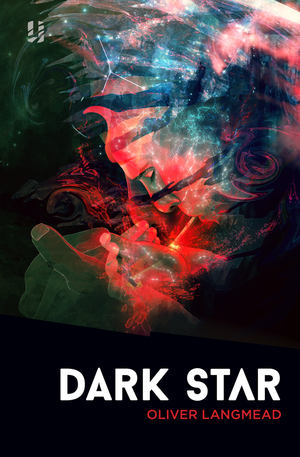 Dark Star is a blend of crime and sci-fi. The story is set in a dark world, in the aftermath of an incredible and dangerous crime. 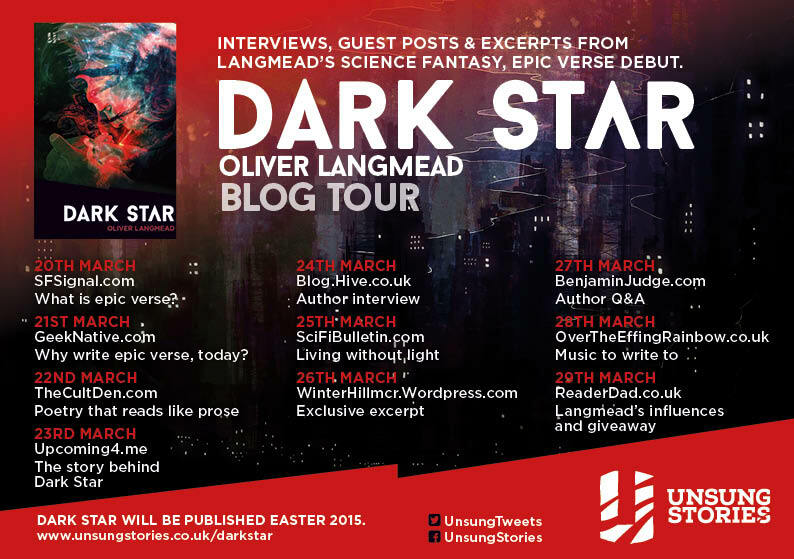 Unsung Stories, the British publisher, launched the book on the day of the solar eclipse in Europe and is masterminding a blog tour with the author Oliver Langmead. Geek Native is proud to be part of the tour, you can see further details in the graphic at the bottom of the post, and took this chance to explore the inspiration and origin of Dark Star with Langmead. Why did he write the book? Can you give us the elevator pitch for Dark Star? That’s the imaginary scenario in which you’ve a single elevator ride to explain to someone why they should pick up the book and give it a chance. Imagine a world orbiting a dark star. Imagine a city where light is scarce; where light is the currency, the drug and the religion. Imagine a girl found dead down a dark back street, with brightly glowing veins. Could you leave that mystery unsolved? The story is a combination of so many different influences that it would be difficult to name them all. I have to name writers like China Mieville, Raymond Chandler and John Milton. Perhaps the most recognisable influences on the book might even be films, like Frank Miller’s Sin City and, of course, Blade Runner, for their bleak atmospheres. But most of all I think that the story was born of wanting to write my own detective story, and to do it in a way that would be uniquely my own. Can you tell us about light – or the lack of it – in Dark Star? Does fire burn black? The local sun’s light burns on a spectrum not visible to human eyes, along with all local fuels. So, no colour at all. You might see some distortion in the air at the end of a match, or smoke rising from larger flames, but otherwise in the city of Vox fire is invisible and very, very dangerous. One bad lightning strike and the whole city burns, because it’s nearly impossible to fight flames you can’t see. Dark Star is written in verse and then there’s Surgyn. Can you tell us about the role of music in your life? Music plays a large part in what I do, but perhaps not as extensively as you might imagine. For those who don’t know, Surgyn is my band; we’ve released a couple of CDs and toured fairly extensively over the years. First and foremost, however, I think of myself as a writer. And if anything I’d say that my writing has influenced my music more than the other way around. Certainly, there are some brilliant experiences to be had (and great stories to tell!) in music, and in travelling from place to place to perform. But at the root of all that is my writing which informs the lyrics I write, and from that the concepts that make the band work. Dark Star is just that in its purest form: writing, without the music around it. Our main character, Virgil the cop, doesn’t always seem like a hero. Is he the shade of grey in a world of darkness? I’d say that Virgil is more the embodiment of his dark world. He’s bleak, downtrodden, and addicted to light in all its forms, but occasionally made redeemable by his determination and hope. I don’t think that at any point during the book Virgil considers himself a hero. In fact, I’d leave that up to the reader. Is Virgil right? Is he ever really a hero at any point? Even in his previous case – the one that brought him his fame – did he solve it in any way that wasn’t due to luck? Is there a pro or anti-drug message in Dark Star? If there is a message either way, then I didn’t intend it. Drugs or not, the whole book is full of addiction. From the way ghosts are addicted to, and driven mad by, their lack of light, to the way Virgil is a slave to his drug of choice – liquid light: Prometheus – and beyond, to the attitudes of the people who live in the dark city of Vox, hoarding their glows. I never intended to either sanction or condemn the use of drugs. That wasn’t my purpose with Prometheus. But in the end, my authority on any messages that the book might contain is limited. That’s up to the reader! Maybe it’s possible to read something into the text that leans either way. Scottish gamers might know the roleplaying game SLA Industries which is set in a grim world where it always rain. Here we are with a world set in darkness… is there a Scottish connection again? I wouldn’t say that Dark Star is particularly related to Scotland, beyond the fact that I live there and wrote it there. In fact, I’m sad to say that I hadn’t even heard of SLA Industries before now! If any roleplaying game has touched the direction I went on with the book, though, then it would probably be Dark Heresy. There’s something about the way that imperial society interacts with technology in that setting. As well as the general atmosphere, of course: that bleak vision of humanity, scattered across the stars and driven back to a dark age. Are you a gamer? Which games would you recommend? If you’re a roleplayer, then I recommend Rogue Trader. Put together a crew a bit like you would for Star Trek, and then send it off into the grim unknown of the Warhammer 40,000 universe. I’m currently playing as Lord Captain Salem of the Sparrowhawk on Mondays, bravely exploring the Koronus Expanse and desperately trying to not get eaten by a warp kraken. If you’re a board gamer, then I recommend a game called Betrayal At House On The Hill. If you don’t know, it’s a game in which the players explore (and build) a haunted house, before one of them betrays the rest and unleashes one of fifty(!) different supernatural horrors upon them. Different every time. My only regret is that I have yet to betray anyone. And if you’re a video gamer, then I recommend the Dark Souls series. There’s nothing else quite like it out there. The rich world, and challenging bosses (as well as normal enemies) make for a completely unique experience. What might we expect from Oliver Langmead next? That’s a good question! I’m writing, and I imagine that I’ll keep on writing for the rest of my life. We’ll just have to wait and see if anything else emerges intact from my scribblings! 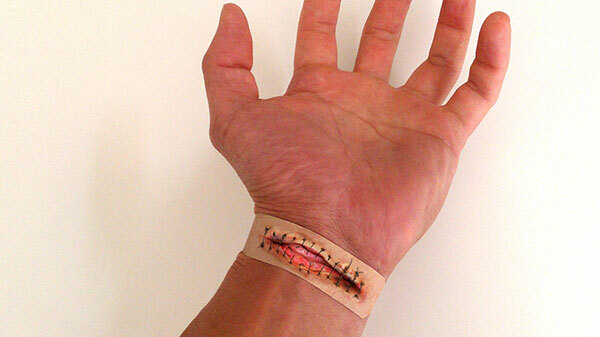 Tabletop RPGs Gross first-aid plasters – for larpers?